9th March, Seong-Nam, Korea: Asian Youth four gold medalist, Choi Tae-Seung set a new Korean record after rolling three consecutive perfect games during the Korean National Youth team selections at Tan-Chun Bowling Center on Friday. Choi, who stole the limelight at this year's Asian Youth Championships in Cairo, Egypt by bagging four gold medals, had a poor start in his opening game with 153 but quicken his pace with 192 in the second game. But the 20-year-old Korean youth scorched the lanes with his first 300 in the third game and beyond expectation, the youngster downed a second 300 in the fourth game. 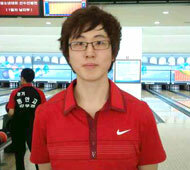 Then Choi shot the historical third 300 in the fifth game. The overwhelming achievement must have unsettled him a little as he followed it up with 183, 197 and 229 to end the 8-game roll-off with 1854 to finish fifth. There are three more blocks of 8 games left to play so perhaps Choi can make up some ground and gets selected for the World Youth team which is scheduled to be held in Bangkok, Thailand from June 22 - July 3, 2012. News courtesy of Korean Bowling Congress, photos by Terence Yaw. 18th Dec: Malaysian wonder boys triumphs. 22nd Oct: Wu, Pluhowsky wins Masters titles. 26th Aug: Korean star topples top seed. 26th Jul: First home title for Indonesian. 25th Jul: First for Singapore, second for Thai. 18th Jul: Champions claim maiden tour title. 17th Jul: Second Asian title for American. 11th Jul: Kuwait, Korea shares glory. 3rd Jul: Second home title for Macau. 2nd Jul: Thai ends drought with victory. 19th Jun: Sports School youth captures title. 14th Jun: Korea ends with Masters double. 4th Jun: Emirati wins title for second time. 18th Apr: Thailand celebrates second double. 17th Apr: Double maiden victory for Koreans. 31st Mar: First tour title for Saudi. 30th Mar: Defending champion retains title. 23rd Mar: Aussie claims second leg title. 22nd Mar: American claims maiden title. 17th Mar: Narrow victories for champions. 13th Mar: World champion wins first EBT title. 6th Mar: Convincing victory for Barrett. 27th Feb: Asian champ wins season opener. 26th Feb: Big home win for Emirati. 26th Feb: Singapore wins third gold. 19th Feb: American PBA pro wins title. 13th Feb: American wins first career title. 23rd Jan: Kuwait, Korea shares glory.